Compilation. Video transfer of films made by Don and Phyllis Munday, showing travel to the Coast Range and mountain climbing trips. The films included are MOUNT SILVER THRONE, KLINI KLINI, MOUNT QUEEN BESS, A BECKONING PEAK and MOUNT RELIANCE. 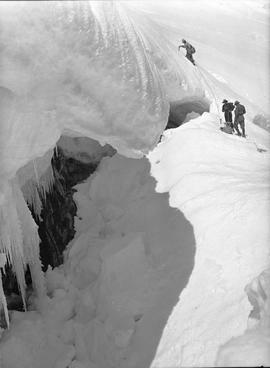 Last valley camp of the Henry Hall 1933 Coast Mountain expedition; Phyllis Munday in cooking in camp. Amateur film. 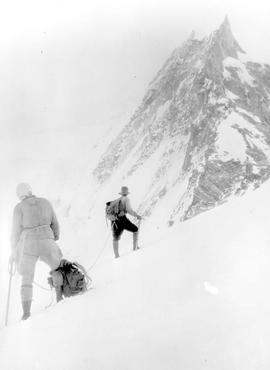 Shows Don and Phyllis Munday on an expedition to climb Mount Waddington, via Franklin Valley, Franklin Glacier, Dais Glacier, etc. Phyllis Munday making a meal at base camp, Waddington expedition.